Donald, who has multiple sclerosis, found his handicap too much to continue bowling so he was pretty dejected. He enjoyed bowling at Kippen BC outdoors and Fintry indoors and was naturally disappointed that his bowling activities might come to an end…or so he thought. 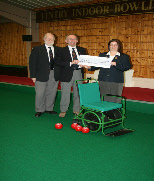 His friends persuaded him to use a special bowls wheelchair – a Bradshaw Bowls Buggy – which was available at the Fintry club. Initially reluctant, he did give it a go and he has not looked back since. The chair allows him to get up and down the green easily and helps him to stay balanced when he is delivering his bowls, particularly helpful for his MS.
Don enjoys it so much that he decided to encourage other disabled people to have a go. Of course, more wheelchairs were needed. Through grants, donations, fund raising events and lots of hard work he has managed to raise £12,000 – enough to buy another five Buggies.